The 27 radio dishes are alined in a Y shape to act as one large radio dish. They are moved closer together to find out more specific information about the target at a lower resolution, and moved farther away to show a broader higher resolution image. 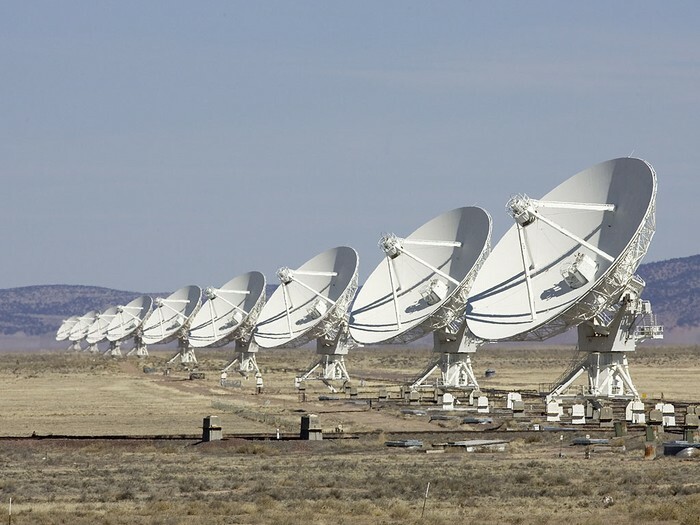 The dishes independently record the radio waves and the time they were recorded. Then a computer puts those waves together to create an image of what the dishes "see". Its isolated enough to produce images of strong isolated radio sources in as little as a few minutes. They have recorded radio emissions from a brown dwarf, and found giant ring like structure around a cluster of galaxies. They are preparing to upgrade to a larger fiber optic system connected to a new correlation computer.